Pops Concert was a favorite of the year for many! Minnie the Moocher as performed by Leo Zigmond and the Jazz Ensemble. 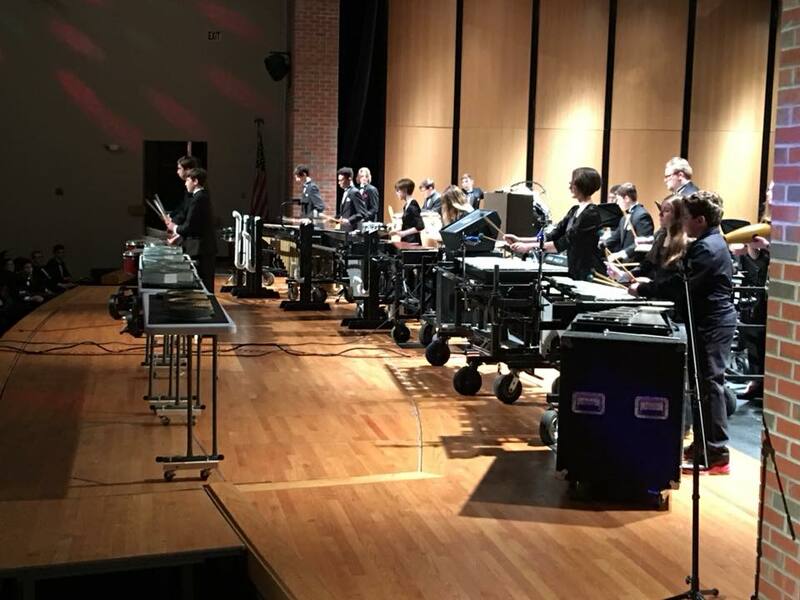 State Champion Avon Lake Indoor Percussion Ensemble performing at the Pops Concert. Congratulations Symphonic Band on your Superior Rating in Class AA and Concert Band on your Superior Rating in Class C at the 2018 OMEA Adjudicated Event. Click here for information about rules, scales, etc. The Ohio Music Education Association District 4 Solo and Ensemble Contest was January 20th, 2018 at Padua HS. Click on the solo and ensemble icon to go to the website for rules, scale requirements, and other information. Performance times can be found by checking with your band director. Avon Lake High School Band was represented well with more than 90 students participating! Students have a number of award-winning ensembles to choose from at Avon Lake High School. Incoming freshmen are offered the opportunity to audition for the Symphonic Band but most will enroll in the Concert Band. The Symphonic Band and the Concert Band combine in the fall to create the Marching Shoremen. Almost all of the students, with a few athletic exemptions, are members of the Marching Shoremen, a vital part of our high school music program, and...if you ask our students, they will tell you it's the most fun! 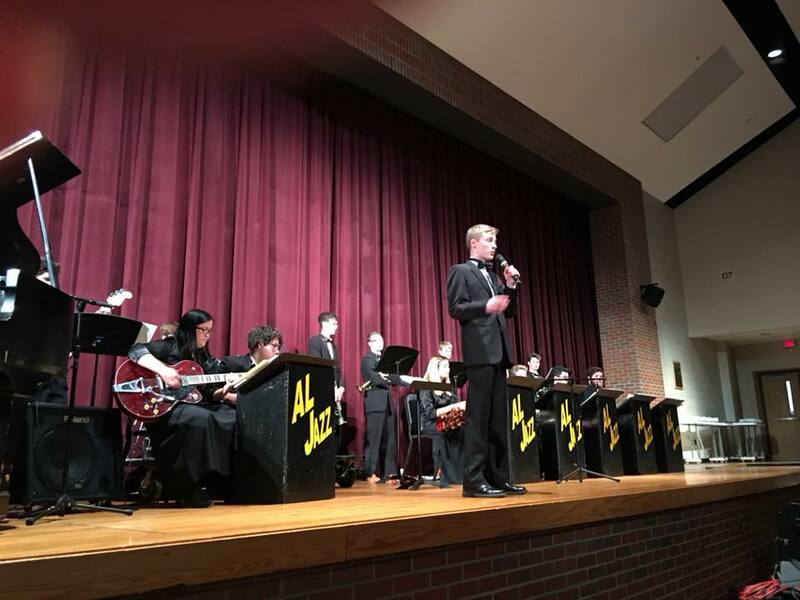 Upon completing an audition and with permission from the director, students may enroll in the Avon Lake Jazz Ensemble which meets during the school day and once a week after school. This ensemble explores improvisation through many styles of music including blues, swing, fusion, latin jazz, bebop, and cool jazz. The Avon Lake Pep Band is a volunteer group that plays in the winter at varsity boys and girls basketball games, hockey, and wrestling. The Pep Band is often called upon to provide "send-offs" to individuals and teams heading to the state playoffs. The Avon Lake Bands, under the direction of Mr. David Eddleman, have earned 40+ Superior Ratings at Ohio Music Education Adjudicated Events, which includes performances by the Marching Band, the Symphonic Band, and the Concert Band. The superior ratings affirm the quality of Avon Lake's music programs. The acclaimed Avon Lake Symphonic Band has performed at Severance Hall in Cleveland, Orchestra Hall in Chicago, and at Carnegie Hall in New York City. The award winning Marching Shoremen, eight times State Marching Band Finalists, have performed at the Gator Bowl, Champs Bowl, Outback Bowl, Camping World Bowl, Indy 500 Parade, Universal Studios, Cleveland Browns Stadium, Progressive Field, the InfoCision Stadium at the University of Akron, and at Ohio Stadium at The Ohio State University. (December 8, 2016) The Daniel B. Ross Performing Arts Center was full on December 8th when the Avon Lake HS Bands and the Learwood 7th and 8th Grade Bands performed. After the concert, both the HS and Learwood jazz bands performed for families and friends in the Commons for the cookies and punch reception. It was a festive evening to usher in the holiday season! (December 8, 2016) Hear the Avon Lake HS Concert Band and Symphonic Band, and the Learwood MS 7th Grade Band and 8th Grade Band. There is a cookies and punch reception after the concert in the ALHS Commons where you can hear the ALHS and Learwood Jazz Bands perform. Cash donations graciously accepted at the doors with all proceeds to benefit the 5th through 12th grade instrumental music program. The Band Hall Wall of Fame. The judges' sheets from the 95 students who participated in the OMEA Solo and Ensemble Contest in the spring of 2016. The scoresheets and certificates from the sweep of superiors at all marching band contests in the fall of 2016.